El sistema de construcción Arch, que yo sepa, solo se aplicó en España al buque SAC 6º. Sin embargo, por la costa cántabra navego un buque construido según esta técnica, con un nombre muy de la tierra: LUIS PIDAL. Su vida fue muy extensa y nunca llevo el pabellón nacional, pero fue tripulado por marinos españoles, cargaba y descargaba habitualmente en puertos españoles, y su bandera era belga. La compañía propietaria; la Real Compañía Asturiana de Minas. En un excelente artículo de la revista The Marine Engineer and Naval Architect (un tesoro salomónico cuando se es propietario de una de ellas), en su número 424, Vol: XXXV, Part. VI, edición de enero de 1913, titulado Some Modern Systems of Ship Construction, se hace una muy buena descripción del principio Arch, según la patente Ayre-Ballard. Leamos: …”The Arch Principle of Construction (Ballard Patent). In this type of vessel the principle departure from usual practice is in the, direction of transverse form, though, as will be seen later, the design includes that which tends to increased strength. Up to the moulded depth line, continued forward to about the break of the forecastle, and aft to about the break of the poop, the ordinary frames are run. 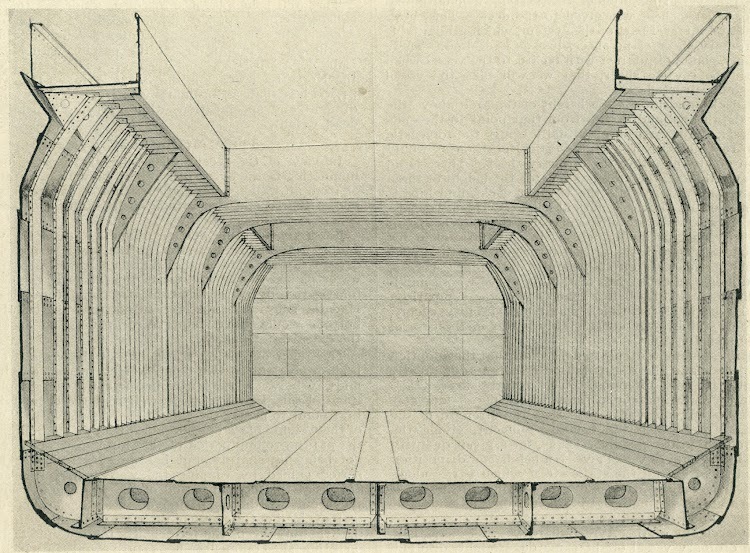 From this point an arch springs, the object of this arch being to support the deck and all probable top weight, without any pillaring being necessary and at the same time to gain buoyancy and draft economically. In this way holds free of obstruction are obtained, and all the advantages of web framing are retained without the accompanying disadvantages of broken stowage. The arch may also be viewed from another standpoint, that of springing downwards from the deck. In this case it is the upper end of the frame to which the arch gives support. 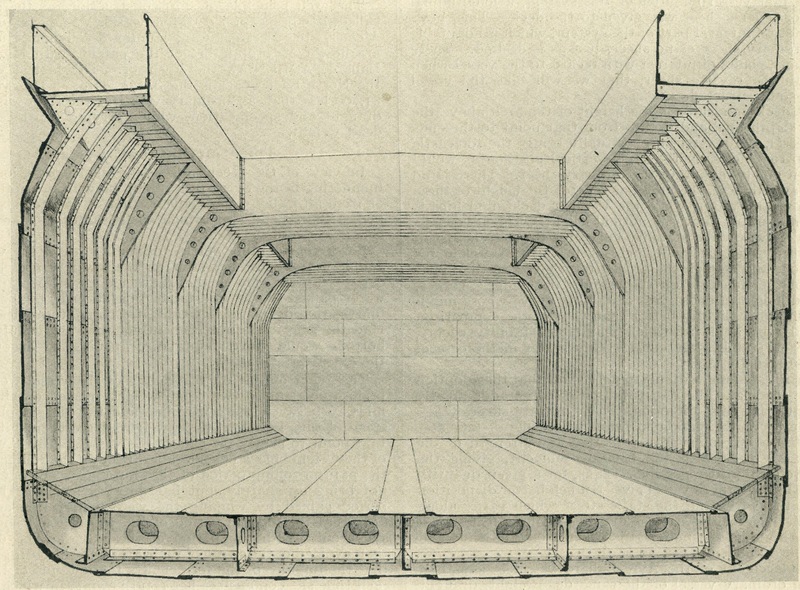 The form of vessel resulting is an absolutely self-trimming one, and the thorough support thus given by the cargo to the frames against which it presses, stiffens the latter when in the load condition, in which case, of course, the greatest pressure of water comes upon the frames. The deck platform provided by the arch is of usual width. In the first vessel built under this system, a longitudinal camber or reverse-sheer was given to the deck. This, however, is not an integral part of the system, which is adaptable to the ordinary sheer or no sheer, just as is desired. There are so many points of interest with regard to the vessel when built with the reverse sheer, that we will take the vessel as being so constructed. As the deck amidships is the height of the arch above the moulded depth line, and droops from that point to the ends of the vessel, the reverse-sheer actually brings the forecastle and poop to practically the same vertical position as would have been got by adopting the ordinary sheer. There is no loss of seaworthiness, therefore, as regards the height of these parts above the water, while the weather deck amidships is raised considerably above its normal height. The advantage of this is shown in the stability curve for the vessel. Even though the vessel has no bridge, as in the type taken for comparison, and though the arched form given to the upper portion of the side cuts off the useful “deck-edge” corner, the added height of deck gives a stability curve whose maximum ordinate is slightly better than that of the comparison ship, while the angle at which maximum stability occurs, and range of stability are considerably better in the case of the Ayre-Ballard vessel. Calculations of longitudinal strength show that the adoption of reverse-sheer and the redistribution of cargo adds greatly to strength in this direction. The reverse-sheer vessel approximates to the parabolic beam whose depth increases towards the centre at such a rate that the strength of the section keeps pace with the bending moment, giving the most economical girder possible. Thus, for a given quantity of material, this form of vessel gives a much better disposition of material to withstand the static stress which varies along the length. Again, the stresses due to pitching are lessened with this sheer, as the material is taken from the ends and massed more amidships. The displacement of the Ayre-Ballard vessel is less than that of an ordinary vessel of the same deadweight, draught and speed. This means a smaller weight of engine to propel the reduced displacement, and a smaller bunker capacity, the coal consumption being reduced by about 5 per cent per day. The Ayre-Ballard vessels have proved themselves to be dry boats and very comfortable. The sloping side takes the venom out of the waves, so that their effect on the rolling is much reduced. Then the fall out of the side, due to the overhung deck, throws the waves back on themselves, leaving a dry platform. 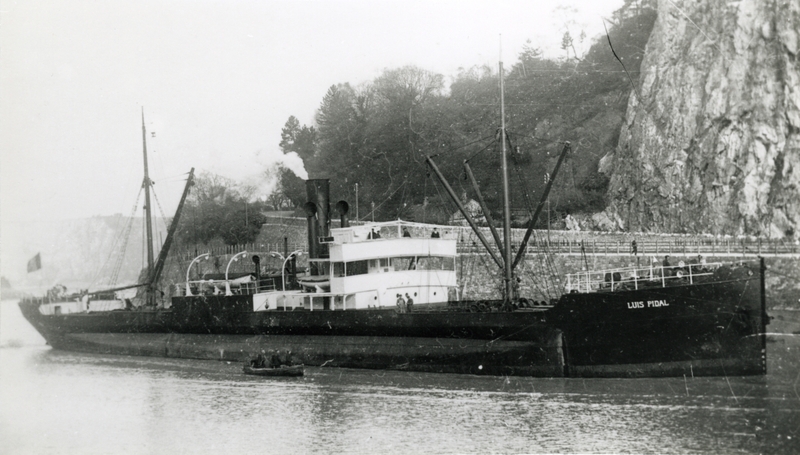 When compared with an ordinary vessel of the same deadweight, draught and speed, the Ayre-Ballard vessel showed a saving in material of some 19 per cent., meaning a reduced initial cost. …”Comenzó a crear su flota –flota con bandera belga y matricula de Amberes- encargando dos unidades a la casa Culiffe & Dunlop (realmente Cunliffe) de Port Glasgow. Fueron el ARNAO y el REOCÍN -los cotos mineros principales- y contraseña cuadra con tres triángulos (rojo, azul y amarillo) las tres iniciales R C A en blanco, las chimeneas eran negras con la contraseña al revés. …”Pero no se hicieron viejos con la bandera belga los dos costeros. En 1906 el REOCÍN se vendió al armador de Requejada José Díaz, del que hablaremos enseguida. Con él y bajo pabellón español ya para siempre, sirvió hasta que ya en 1934 pasa a la actual Naviera del Nalón con el nombre de MINA COTO que conserva hasta el fin de su vida. El ARNAO siguió idéntico destino en 1909 y duró con Díaz hasta 1928. El LUIS PIDAL fue en origen el granelero THYRA MENIER, quien entre 1918 y 1925 llevo el nombre de LUIS PIDAL. THYRA-MENIER, de 1912 a 1918. Para Donald Steamship Co Ltd.
BELLINI, de 1925 a 1928. Para Puglisi & Tomasini. BOLLAN, de 1928 a 1936. Para August Bolten. Adquirido por el Ministry of War Transport como reparación de guerra y renombrado EMPIRE CONDERTON, de 1945 a 1947. Para el Ministry of Transport ingles operado por Alliance Marine Transport Co Ltd.
MARCHMONT, de 1947a 1952. Para J P Hadoulis Ltd. En 1952, con el mismo nombre para A Moschakis Ltd.
IRENE M., de 1952 a 1957. Para Tampa Shipping Ltd. En 1957 pasa a propiedad de Marine Industries Ltd., de Montreal, y es desguazado a finales de ese año.